Professor Jamilah posing at the Book Launch in June, 2014 and with her husband, Tan Sri Dato' Haji Abdul Ghani Othman. Professor Jamilah Ariffin is one of our country's high-achieving academics with a lifelong commitment to development initiatives, primarily in the academic research fields of "Women and Development" and Society's Well-being. Sent to Australia as a Colombo Plan Scholar for her university education, she holds a Bachelor of Arts degree with first class honours, majoring in Sociology and a minor in Economics. Subsequently, Jamilah Ariffin proceeded with a Master of Arts and PhD in Development Sociology, with an emphasis on assessing the socio-cultural impact of economic growth Projects on human welfare. She is currently an adjunct professor with La Trobe University in Melbourne Australia and the University of Malaya. Dr Jamilah has served tenure at four local Malaysian Universities over a period of 33 years. 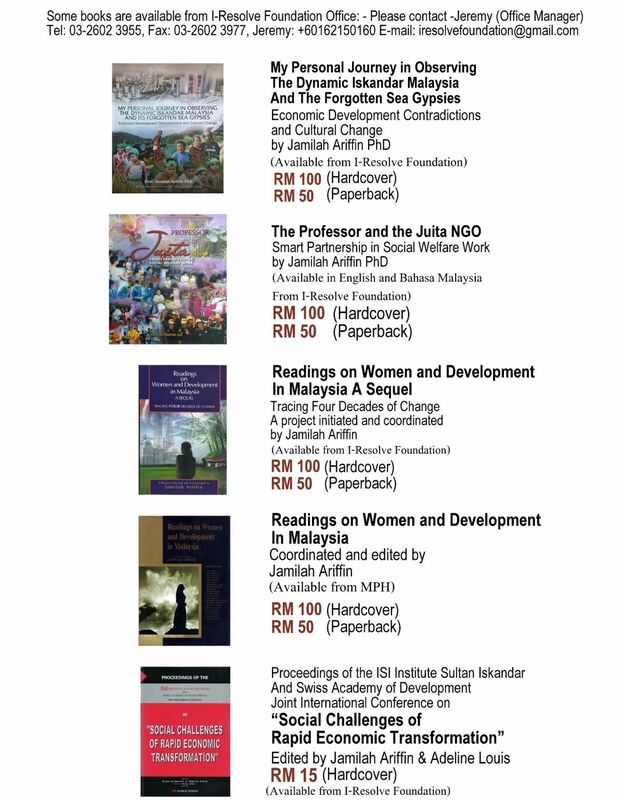 It is a little known fact that Professor Jamilah was one of the few women who helped to draft the first chapter on "Women and Development" for the Sixth Malaysia Plan and one of the most active persons who successfully lobbied for this chapter to be included in the Sixth Plan through which the Department of Women's Affairs (HAWA) was set up and subsequently the Ministry of Women's Affairs. She served on the National Council for the Integration of Women in Development (NACIWID) for 12 years (1988-2000). Jamilah Ariffin was the first consultant appointed by the Malaysian government for the UN Beijing Women's World Conference in China in 1995 and came out with the publication "The Status of Women in Malaysia". She was also the Malaysian government main consultant for ESCAP's pre-Beijing Women's World Conference meeting which was held in Thailand in 1993 and in Jakarta in 1994. Upon achieving the status of Full Professor at the University of Malaya in 1993 Professor Jamilah was elected by a team of eminent Sociology Professors of Australia, Switzerland and United States of America to become the first Malaysian to be a Board Member of the Swiss Academy of Development in Switzerland (1994-2001). She was also the first Malaysian selected to be on the "Commonwealth Expert Group on structural adjustment for women" at the Commonwealth Office in London and as the regional consultant for the United Nation's Economic and Social Commission for Asia and the Pacific region (UN ESCAP) on Women and Development issues. Her contribution to policy-planning matters was through being the Head of the Population Studies Unit while at the University of Malaya (1991-1994) where she organised several trail-blazing conference topics and publications on Demographic change, Economic Growth Policies and its impact on Family Dynamics and pioneered nation-wide research on Women and Development. 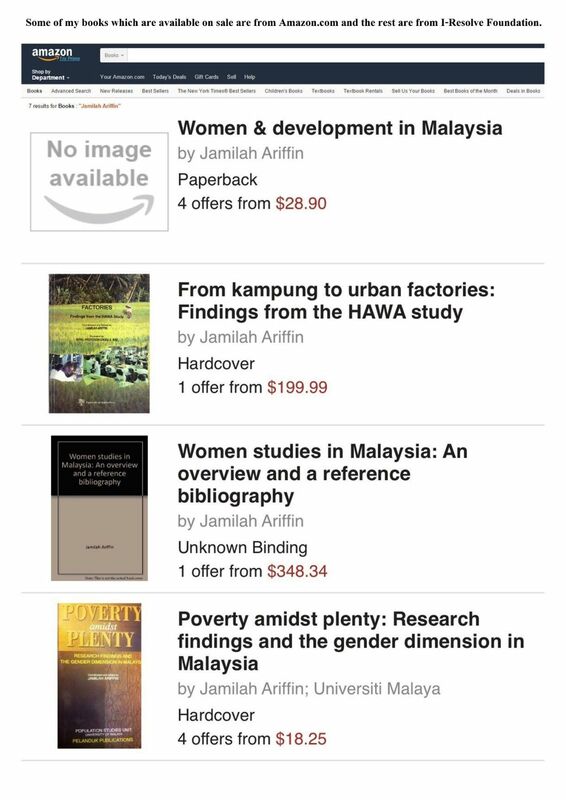 Due to her expertise in these fields, Prof Jamilah Ariffin was chosen by Royal ProfessorUngku Aziz, the then Vice Chancellor of University Malaya to coordinate his research project on Rural Urban Migration of Women Workers. Consequently, she published the ground breaking book on "From Kampung to Urban Factories" (1994). When Prof Jamilah's husband moved to Johor as the 13th Chief Minister, she was appointed as Head of Unit dealing with humanistic aspects of urban development in the Institute Sultan Iskandar at University Technology Malaysia Johor (the consultancy arm of the university). Here, she was actively involved in the team to plan the new capital of Burma as well as leading the major Squatter resettlement study on Kampung Melayu in Johor Bahru. 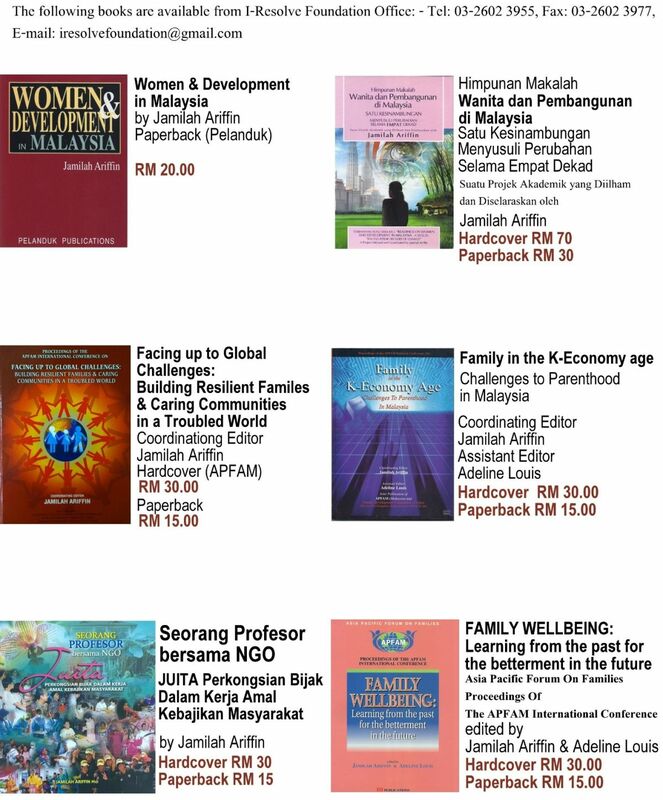 Overall, Prof Jamilah Ariffin has published 15 books and 33 academically acclaimed research journal publications mainly on her research areas of Gender and Development, Labour migration and poverty, Economic Development and Family. Following her retirement from full time employment in 2007, Dr Jamilah continued her passion in sociology research and publication and was appointed as the First Adjunct professor in Gender studies at University Malaya. Later in 2010 to 2014 Prof Jamilah was appointed as Adjunct Professor in Public policy and Public health at Monash University Medical Faculty in Johor Bahru for the purpose of establishing the ground breaking South East Asia research project on data primary collection, valuable to formulating public health policy for the poor and infirm. Her latest book focussing on Economic Development Contradictions was launched in June 2014, titled "My Personal Journey in Observing the Dynamic Iskandar Malaysia and its Forgotten Sea Gypsies." In the pipeline are two upcoming book projects, the first about "Gendered outlook on women roles in Career, Motherhood and Marriage" will be based on research findings of two repeat interviews conducted longitudinally on 3,000 respondents comprising both men and women, studied over a 20-year period (1995-2015). And the concern of the second book project is to ascertain the structural determinants leading to the success of married career women with children and family responsibilities. This book will be based on in-depth life-history data premised on interviews with a wide sample of professional women leaders who have reached the Top post of their professional ladder. Puan Sri Jamilah Ariffin is also currently the President of an International NGO called Asia Pacific Forum on Families (APFAM) which carries out welfare projects for the poor and vulnerable - a role that she has held for the last 16 years. She is also the founder of a research-oriented foundation called I-Resolve Foundation formed in 2012. I-Resolve is the acronym for the "International Research Centre for Economic progress and Society well-being." It is a registered foundation under the Ministry of Finance Malaysia since 2012 and it serves as the intellectual backup to APFAM. The founder of I-Resolve is Prof Jamilah Ariffin; she is the chairperson of I-Resolve as well as the president of APFAM. APFAM is the acronym for the NGO called Asia and Pacific Forum for Families. It is a United Nations Affiliated NGO concerned with Family Welfare representing 12 member countries in the Asia-Pacific region. Since forming the Malaysian Chapter of APFAM, Prof Jamilah has carried out many Family welfare oriented projects in Malaysia (mainly in Johor) for the past 16 years since Professor Jamilah Ariffin held its post of president, especially when her husband, Tan Sri Abdul Ghani Othman was serving as the Chief Minister of Johor (from 1995 to 2013).